“Somewhere in the middle of nowhere. Somewhere in the mountains of the Algarve. Somewhere in between Monchique and Marmelete, there is a beautiful place called Tojeiro. A place where travelers and freedom-loving people meet. A place where different nationalities come together. People, from all over the world, to connect with each other, to exchange experiences and knowledge. The result: A pool of beautiful people with stunning ideas and skills. A pool of creativity. People, who know how to handle a simple life. People, who know how to make something out of nothing. Sounds like a fairytale. But it’s reality. Tojeiro is a place, that gives you the freedom to invent something, either to invent new spaces or even to invent yourself. Every day gives you a new chance to discover your own skills – and to develop. Starting with simple questions such as ‘What are you going to cook this day?’, ‘Who are you going to talk to, to share your new idea?’ or ‘Where is the best shady place to survive the midday heat?’. So whether it’s making something out of different vegetables, having to find the right tool to finish your task, or finding a place to rest comfortably, you always have to get creative. But of course, there are bigger projects that ask for your inventive talent. Projects like making stairs to get downhill without slipping. 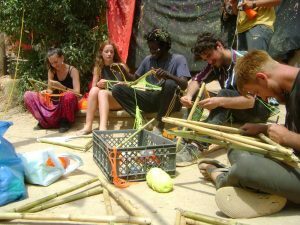 Projects like building a boat out of bamboo sticks and plastic bottles, so that our people can have fun at the big lake. Projects like the second stage, to give us all a new place to dance, have a great party, and celebrate life.